ALL THINGS, even the holiest, are subject to change, especially when they are dependent on man's free will. It is hardly to be wondered at, then, that the Confraternity of the Holy Rosary only retained its fervor for one century after it was instituted by Saint Dominic. After this, it was like a thing buried and forgotten. Doubtless, too, the wicked scheming and jealousy of the devil were largely responsible for getting people to neglect the Holy Rosary, and thus block the flow of God's grace which it had drawn down upon the world. Thus, in 1349, God punished the whole of Europe and sent the most terrible plague that had ever been known into every land. It started first in the east and spread throughout Italy, Germany, France, Poland and Hungary, bringing desolation wherever it came----for out of hundred men hardly one lived to tell the tale. Big towns, little towns, villages and monasteries were almost completely deserted during the three years that the epidemic lasted. This scourge of God was quickly followed by two others: the heresy of the Flagellantes and a tragic schism in 1376. Later on when these trials were over, thanks to the mercy of God, Our Lady told Blessed Alan to revive the ancient Confraternity of the Most Holy Rosary. Blessed Alan was one of the Dominican Fathers from the monastery at Dinan, in Brittany. He was an eminent theologian and was famous for his sermons. Our Lady chose him because, since the Confraternity had originally been started in this province, it was most fitting that a Dominican from the very same province should have the honor of re-establishing it. "How can you crucify Me again so soon?" Jesus said. "What did You say, Lord?" asked Blessed Alan, horrified. "You crucified Me once before by your sins," answered Jesus, "and I would willingly be crucified again rather than have My Father offended by the sins you used to commit. You are crucifying Me again now because you have all the learning and understanding that you need to preach My Mother's Rosary, and you are not doing so. If you only did this you could teach many souls the right path and lead them away from sin----but you are not doing it and so you yourself are guilty of the sins that they commit." "You were a great sinner in your youth," she said, "but I obtained the grace of your conversion from my Son. Had such a thing been possible I would have liked to have gone through all kinds of suffering to save you because converted sinners are a glory to me. And I would have done this also to make you worthy of preaching my Rosary far and wide." "See the wonderful results I have had through preaching the Holy Rosary! 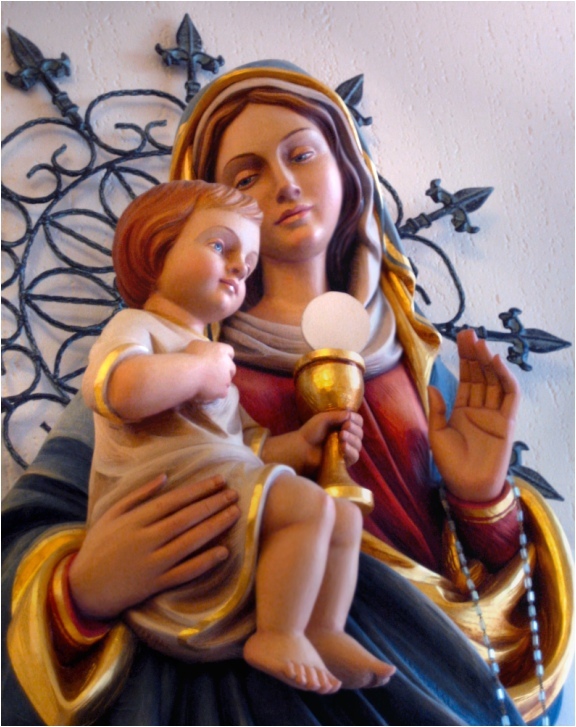 You and all those who love Our Lady ought to do the same so that, by means of this holy practice of the Rosary, you may draw all people to the real science of the virtues."